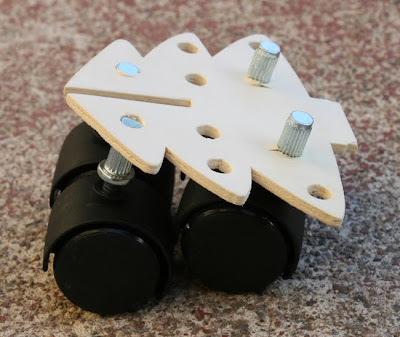 Generally if the kids aren't already stuck into this stuff then all it takes to get them interested is for me to sit down with it and start tinkering myself and they soon come and join me to see what's going on and to join in or start on something else. 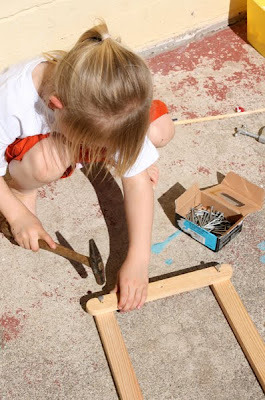 My youngest, who's just turned four, still loves the ease of banging the nails into cardboard boxes, like we did back in this post, but my five year old is now hell bent on "inventing". 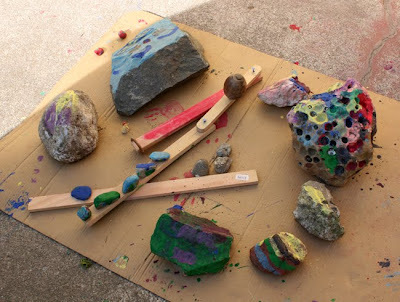 Now that the rainy season is drawing to a close, we can get back outside with this stuff and by the end of the summer I hope they will be confident in using little hacksaws and a manual hand crank drill (I keep waiting for one to show up at a thrift store or garage sale, but it hasn't happened yet). I have some balsa wood to start on that'll make it easier for my younger daughter. My five year old is also going to get extra practise with basic math and measurement out of this stuff that seems to fascinate her too I reckon. After a while, a lot of friends started to gift us with interesting things from their recycling bin! Yesterday we got given a load of those weird plastic Costco apple containers and today we got a load of honeycomb structured cardboard to play with. I'm always rather excited by these kinds of things and the many possibilities they present for construction. 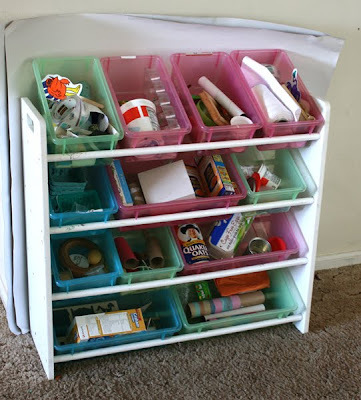 Happily these days, having had the blog for nearly two years, I am lucky enough to have run into a lot of other people out there that find the contents of their friend's recycling bins as full of potencial as we do! Yay intertoobs! I actually have to say a few thank yous to some of these people in my next post. When el hubberino brought home all that cardboard from his workplace today, the kids were just as excited to handle it and talk about all the things it could become as I was, and that makes me loopy kinds of happy. Please let it be sunny tomorrow! love it. if only we had a little bigger place I would love to do the same with my twins. awesome! What do you do with all the 'creations'? I love letting mine create but gee, we do run out of room for the products. WOW! I am so impressed with your trash collection and organization of it. 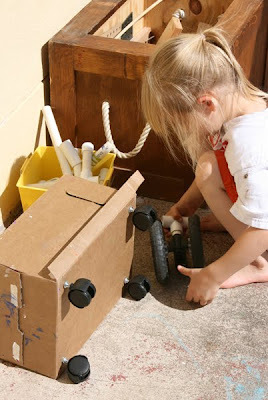 When I was collecting trash to replicate your Wall-E last summer my husband thought I was nuts as the big Tupperware bin that I'd placed in the corner of the dining room began to over-flow with junk. It definitely made me wonder where and how you store everything. Thanks for sharing and I can only imagine what your girls will end up doing when they grow up... the possibilities are truly endless with how amazingly well you have managed to open their creative minds. That little wheeled basket is very cool! 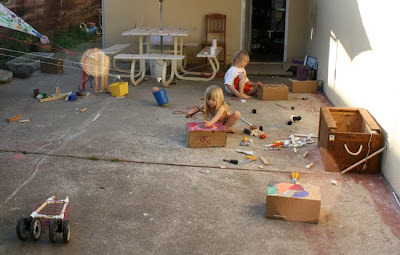 We currently have three large cardboard boxes, plus a flat packing box from IKEA that I intend to turn into something. I want to get a proper xacto knife first - I'm tired of trying to saw cardboard with low-quality kitchen knives! I love love love this post. 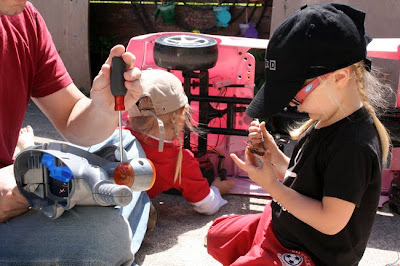 It reminds me of Gever Tulley and his Tinkering School - you have made your very own tinkering school :) I'm thinking of ways we can do this at preschool - I'm going to have to start collecting old odds and ends and bits and pieces together. 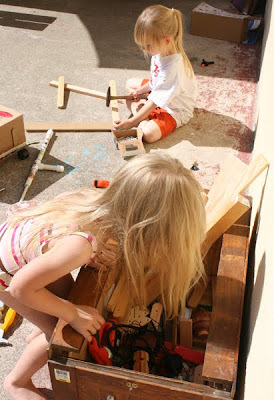 I love the way your kids have used all the materials with so much imagination and creativity! My wife won't let me keep junk at the house any more. Luckily, I have a school where I can keep it! 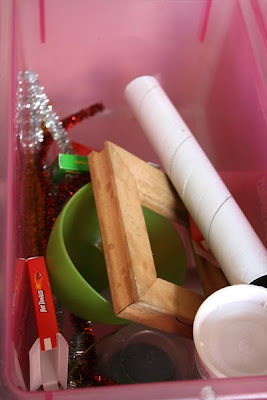 You've inspired me to break out the junk boxes today and see what we can make! Thanks. I see future sculptors in the making!! Love the stroller! Hurrah, little filth wizards! We have a lot of junk. 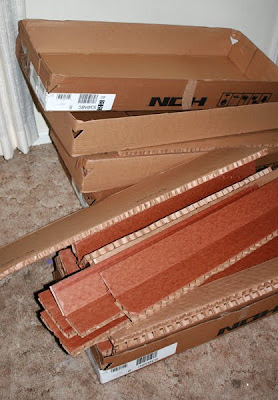 Mostly cardboard, because it can be folded flat and hidden under beds. The husband does not enjoy junk but he knows to save large cardboard boxes and inner tubes that support rolls of flooring etc because I love them more than flowers/roses/diamond jewellery. Storing the pre-creation raw materials isn't a problem (they can be hidden away!) 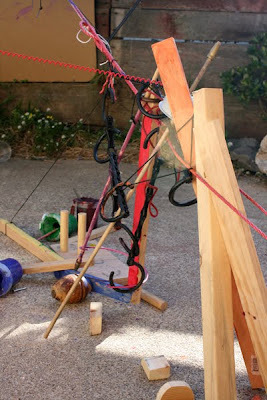 - the challenge is what to do with the creations when they are made. Mostly we throw them out if they fall apart. Or if we get tired of them. We chant, "The fun was in the making." as we toss them (either back in the recycling bin or the trash). It's sad (sniff) but necessary. 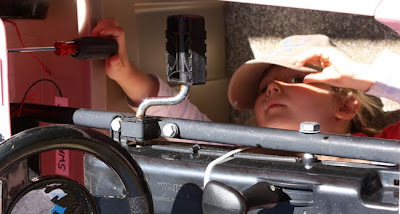 Is it possible you would ever want to start a summer camp? 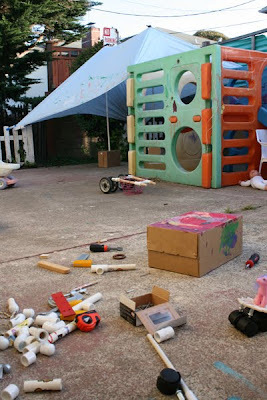 Kebeni: Things the kids make tend to last anywhere from half an hour to three or four months generally, depending on if they want to use the pieces to make something new, or if they play whatever it is to death and it becomes one with the recycling again. They seem to care more about the act of making the stuff rather than the need to preserve it forever, so we don't really have a problem with dismantling stuff. Not sure why they feel that way, but it does make things easier for sure than if they were hell bent on keeping it all for posterity. Molly: No plans to make a summer camp or anything. 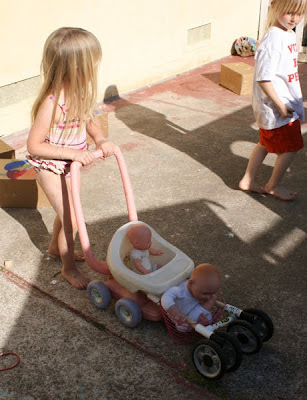 There are usually a few extra kids around here anyway at the moment. Maybe when my kids are grown up a bit and I yearn for the messy toddler/preschooler experience some more I'll look into it though! Love this! I have also started collecting random pieces and parts and cool empty containers for future unknown projects. Lucky for us, there is a store in town called Leftovers, where I can get all kinds of random containers (empty tissue boxes or jars or Altoid tins) or craft supplies (ribbons or buttons or fabric pieces). It's heavenly! Maybe one day I'll post about great ideas I've gotten from Leftovers. I'll let you know if I do! Geez, I don't have junk. This living situation doesn't allow much for that. But maybe we can work something out. How about if I save all my weird recycling for you and let my kids make their messes at your house? I also adore the imagination and creativity in this! I so love that your kids get to fill their trunk with junk ... and your living room with junk ... and your yard with junk ... BUT as they say ... "one man's junk is another man's treasure" ... and clearly to your children this is treasure ... and the fact they got so excited about the junk your husband brought home ... delightful ... I love it! Great post. There is so much I love about this post! 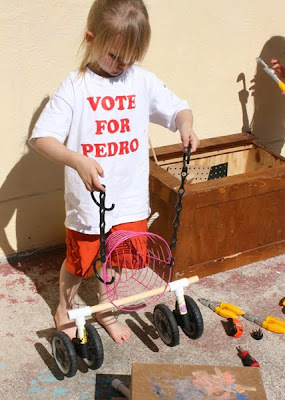 I love that your girl is wearing a Vote For Pedro shirt. Totally made me smile. 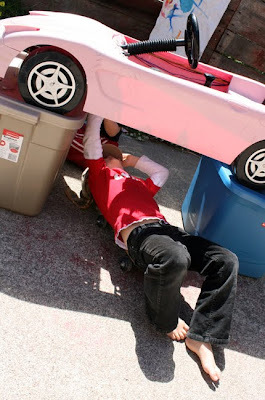 I also love the pink car set up on blocks. 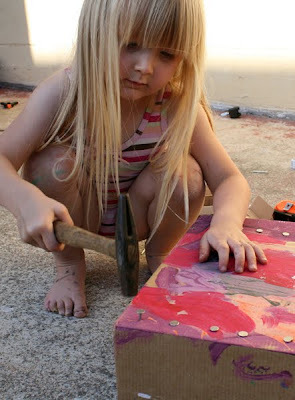 And the little one hammering nails. Wow. Creators, indeed. Thanks for all the awesome ideas! We have a place here in Oxford called the Orinoco Scrapstore which is a junk paradise. They get all sorts of stuff: from over runs of odd things from factories to offcuts of fabric and fishing nets. They are also big recyclers of paint since this can't be put in landfill any more. I scored a half tin of white eggshell emulsion for £1 from there last week which was just enough to freshen up our entrance which had started to luck a bit yucky. I love junk but desperately need junk storage solutions.... My fabric junk is taking over and if we add cardboard and 'tat' to it we may well drown. Oh and I use a serrated bread knife to cut cardboard - works better than a straight edge! I love this blog but it is purely a spectator sport for me at the moment. 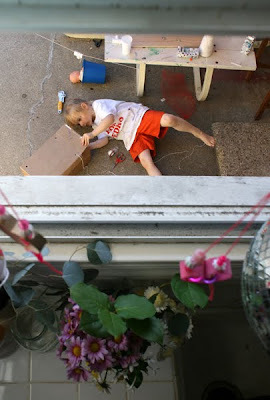 No Internet in my day as a mom, but I was what we called "The Kool-Aid Mom," when our son was young. Lots of kids who weren't ours, projects of all kinds all the time and I had junk everywhere I could keep it - even still at my parents' house when it got too much for our small living space! One of my great-nieces said of me, "Everything you do is a craft!" Just about. 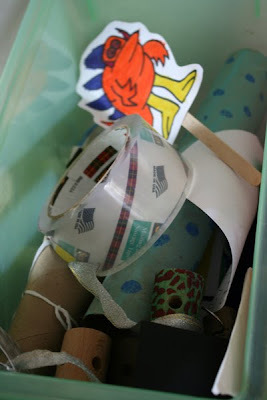 Now I save small things (and mail 'em) to my grandsons, ages 1 & not quite 3. Their mother turned me on to this blog and I'm loving it. As her boys get bigger I expect similar mayhem from their house! And I'm not above (below?) allowing time to roll back when they're here and letting them have at it. Fortunately, hubby's more likely to join in as a grandpa than he was as a dad - he didn't think "crafty" back then. I fixed that! Hey _ i've just linked to this post in my blog. 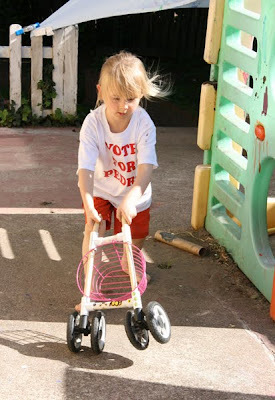 Your approach (and those of some others) has really helped me with some challenges I've had with my daughter who has some difficulties with fine and gross motor skills, and I just wanted to mention it. TA!